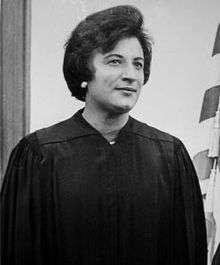 Constance Baker Motley (September 14, 1921 – September 28, 2005) was an African-American civil rights activist, lawyer, judge, state senator, and Borough President of Manhattan, New York City. She was the first African-American woman appointed to the federal judiciary by Lyndon B. Johnson. She was an assistant attorney to Thurgood Marshall arguing the case Brown v. Board of Education. With financial help from a local philanthropist, Clarence W. Blakeslee, she started college at Fisk University, a historically black college in Nashville, Tennessee, but later returned north to attend integrated New York University. At NYU, she obtained her Bachelor of Arts Degree in 1943. Motley received her law degree in 1946 from Columbia University School of Law. In October 1945, during Baker's second year at Columbia's Law School, future U.S. Supreme Court Associate Justice Thurgood Marshall hired her as a law clerk. She was assigned to work on court martial cases that were filed after World War II. In September 1966, President Lyndon B. Johnson appointed her to the United States District Court for the Southern District of New York, making her the first African American woman federal judge. She remained on the bench, including a term as chief judge, until her death. Constance Baker married Joel Motley, Jr., a real-estate and insurance broker, in 1946 at Saint Luke's Episcopal Church in New Haven, Connecticut. They were married until her death of congestive heart failure on September 28, 2005 at NYU Downtown Hospital in New York City. Her funeral was held at the Connecticut church where she had been married; a public memorial service was held at Riverside Church in Manhattan. She left one son, Joel Wilson Motley III, co-chairman of Human Rights Watch, and three grandchildren, Hannah Motley, Ian Motley, and Senai Motley. ↑ "Title IX: 40 Years and Counting: Melissa Ludtke speaks about Ludtke/Time Inc. vs. Kuhn and MLB" (Video). Wellesley Athletics. Wellesley College. 15 February 2012. ↑ Greene, Melissa Fay (25 December 2005). "Pride and Prejudice: Constance Baker Motley b. 1921". The New York Times. Retrieved 14 October 2016. 1 2 Martin, Douglas (29 September 2005). "Constance Baker Motley, 84, Civil Rights Trailblazer, Lawmaker and Judge, Dies". The New York Times. p. 10. ↑ "Constance Baker Motley (1921-2005)". Brown@50 – Fulfilling the Promise. Howard University School of Law. ↑ "CANDACE AWARD RECIPIENTS 1982-1990, Page 3". National Coalition of 100 Black Women. Archived from the original on March 14, 2003. ↑ Holley, Joe (2005-09-29). "Constance Motley Dies; Rights Lawyer, Judge". Washington Post. Retrieved 2014-03-14. ↑ Constance (Baker) Motley, New York Times, September 30, 2005. ↑ Tribeca Film Festival 2015 Guide. Douglas Martin, "Constance Baker Motley, Civil Rights Trailblazer, Dies at 84", New York Times, Sept. 29, 2005.